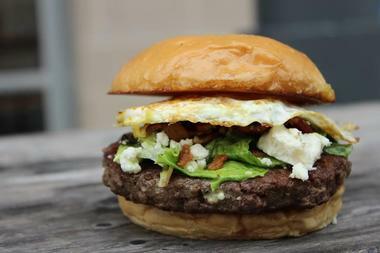 Dallas has so many burger choices that it can be hard to sift through them all to find a truly great burger. From no-frills casual diners to more sophisticated eateries, Dallas has burgers on both ends of the spectrum. Village Burger Bar and Rodeo Goat are pushing the limits of what you can put on a hamburger with their unique toppings and sauces. Boulevardier is a classy eatery serving French bistro fare as well as upscale cocktails and a comprehensive wine list. 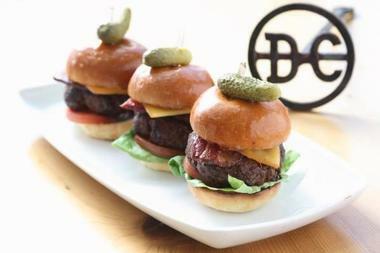 Even though burgers aren't typical French bistro food, Boulevardier has one of the best burgers in the city. 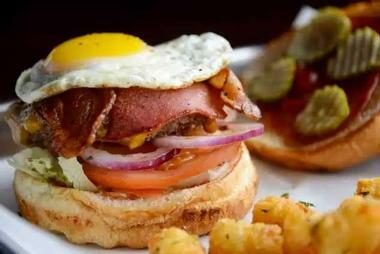 Their grass-fed beef burger is flame-grilled and topped with bacon, giving the burger a distinctive, smoky flavor. The burger is also topped with garden-fresh vegetables, home-made pickles, and cheese. In addition to the phenomenal burger, guests will find delicious favorites such as beef tartar, steak and frites, and fluffy crawfish beignets drizzled with a smoky pimenton aioli. Snuffer's Restaurant & Bar has been a Texas institution since 1978. 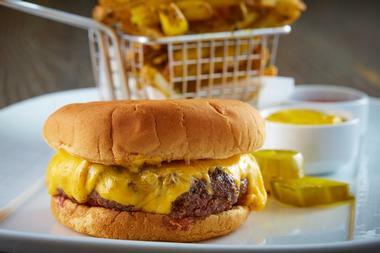 The restaurant serves a menu of legendary burgers and much-loved cheddar fries. The menu has a selection of appetizers to get your meal started, including the cheddar fries, chips and salsa or queso, and a variety of fried foods. © Twisted Root Burger Co. 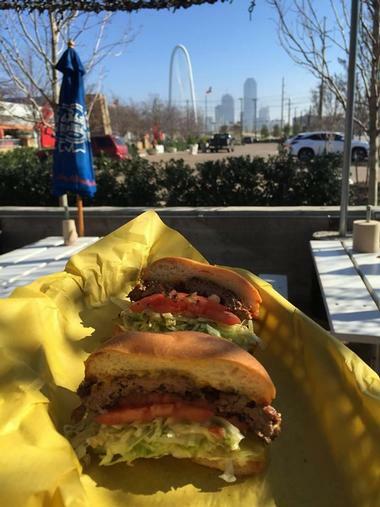 Twisted Root Burger Company is a chain of restaurants serving outstanding burgers. The restaurant offers a selection of gourmet beef, vegan, and turkey burgers dressed a variety of ways. Twisted Root also serves game meats ranging from the more commonplace buffalo to more exotic animals such as beaver, gator, and emu, which are available seasonally. The menu and meats available may vary by location. In addition to burgers, the menu includes a selection of fried side items as well as salads and kids' meals. You would be missing out if you didn't accompany your burger with a hand-spun custard milkshake or spiked "adult" shake. Knife is a high-end hotel restaurant serving classical modern steakhouse cuisine. 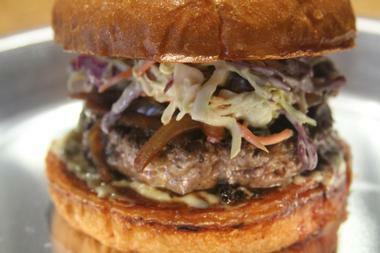 Even though the restaurant specializes in steak, Chef John Tesar has created a memorable burger in the Ozersky Burger. The Ozersky Burger is a tribute to an Esquire food writer named Josh Ozersky, who is a personal friend of the chef. The burger is simple but tasty, consisting of a 44 Farms beef patty topped with American cheese, homemade pickles, and onions. The burger is served with a delicious side of salsa verde fries. This Highland Hotel restaurant also offers a selection of creative cocktail beverages and cigars. Proof and Pantry in the Arts District serves New American cuisine with seasonal offerings featuring global flavors and a particularly tasty burger. Perhaps the most surprising thing about Proof and Pantry's burger is that it is served with a Kraft Single on it. The quality burger patty is made from Wagyu beef, short rib and sirloin, which more than makes up for the low-quality cheese. The burger is topped with sautéed onions, capers, and a touch of Dijon mustard. Guests can choose from sides of bok choy, fried onion, mac and cheese, and Broccolini. In addition to fantastic burgers, Proof and Pantry also offers a special three-course dinner that is perfect for the pre-theater crowd. The Grape is a longtime resident on the Dallas burger scene, serving tasty New American cuisine and a famous brunch burger. The restaurant boasts that they have the "Best Burger in Texas" and that statement has been backed up by Texas Monthly. 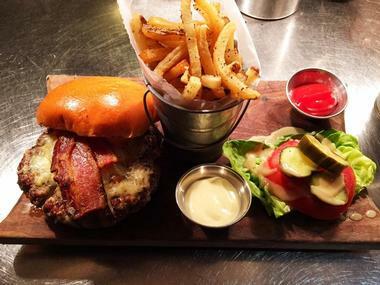 This massive burger is stacked high and topped with cheddar cheese, house-made peppered bacon, horseradish pickles, and dijonnaise, served with a side of house-made fries. The restaurant focuses on simple, functional dishes that are timeless. Each month the menu changes slightly to feature seasonal specialties and fresh, local produce. Brunch favorites such as biscuits and gravy, grilled shrimp and grits, and Texas cobb salad share the menu with the famous burger. Blues Burgers is a no-frills counter-serve restaurant serving a selection of delicious burgers, sandwiches, salads, and drinks. 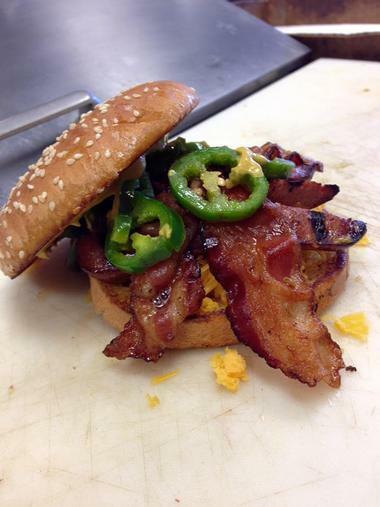 Perhaps the most well-known burger at Blues Burger is the HMF, which is memorably spicy. The Angus beef burger is piled high with applewood-smoked bacon, ghost pepper cheese, grilled jalapenos, grilled onions, and a special spicy Blues sauce. Several other burger options also appear on the menu, including both classic and unique options. All of the burgers at Blues are served on locally baked buns. Guests can wash their burger down with a locally produced soda from the Oak Cliff Soda Company, iced tea, or some of the several beers on tap. Chip's Old Fashioned Hamburgers is a popular award-winning burger joint with two locations in the Dallas area. The restaurant uses fresh, high-quality ingredients to make their burgers, sandwiches, salads, and sides. The burger options are build-your-own style. Guests choose their burger from choices of a 1/3 or 1/2 pound of Angus beef, turkey, bison, tuna, veggie, or portobello mushroom patties. The bun choices include the highly popular poppy seed as well as whole wheat and white. All burgers include mayonnaise, mustard, tomato, lettuce, pickle, and onion. Additional topping options, which can be added for a charge, range from several cheese options and caramelized and shoestring onions to mushrooms, fried green tomatoes, and more. Chip's has its original location in University Park and another in the Lakewood neighborhood of Dallas. 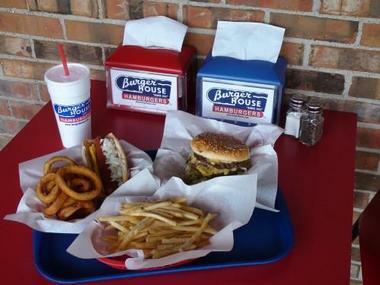 Burger House has been a staple on the Dallas-Fort Worth burger scene for over 60 years. 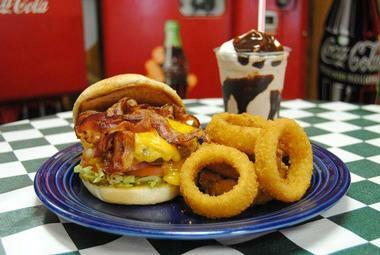 The chain of restaurants is based in Dallas and serves old-style burgers, shakes, malts, and crispy seasoned fries. They are famous for the special seasoning they use on the patties and fries and all of the burgers are topped with mustard, lettuce, pickles, tomato, and onions. There is a variety of sides that can be ordered separately to accompany the burgers and include garden salads, chili cheese fries, chili, and Jack's Famous Fries. Burger House is a family-friendly restaurant with a casual atmosphere and several kids' meal options. Dugg Burger is a casual burger shop that serves unique, custom burgers. The distinctive thing about Dugg's menu is the burger assembly. 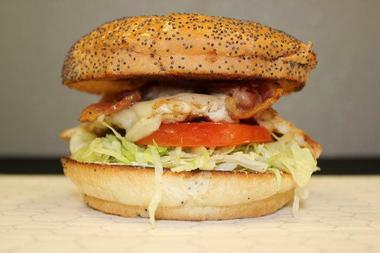 The top bun of the burger is hollowed out and filled with the guest's choice of toppings from Dugg's list of 12 regular toppings and one ever-changing topping item. The burgers are served with sides of fries, soda, local craft beer, milkshakes, and wine. Additionally, the restaurant uses the hollowed-out portions of bun to make a tasty bread pudding. 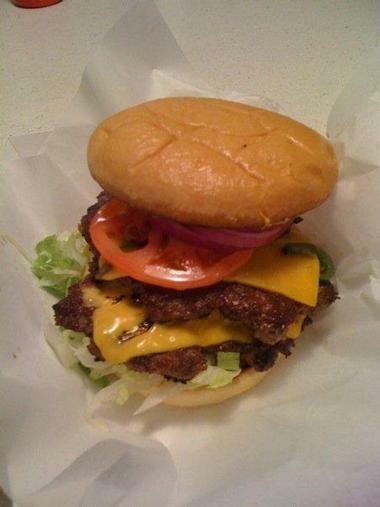 Dugg Burger has a location in Casa Linda Plaza in East Dallas as well as one in Plano. Keller's is an old-school drive-in restaurant that serves tasty diner food including burgers and more. Service is done by carhop and the scene includes both families and motorcyclists. 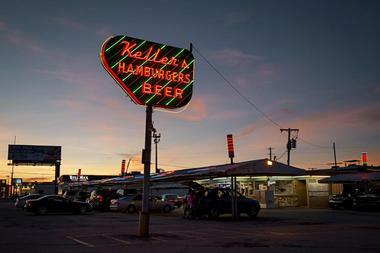 Keller's is a Dallas institution and has been serving burgers, tater tots, and milkshakes for more than 50 years. The burgers are simple and small, but the restaurant's nostalgic atmosphere and affordable price point more than make up for it. Guests dine in their own vehicle and the restaurant looks virtually the same as it did at its inception 50 years ago. Dallas is home to three Keller's drive-in locations, including one on Harry Hines Boulevard and another on Garland Road. Angry Dog is first and foremost a bar and only secondly a restaurant, and specializes in beer, including several locally brewed beers. The restaurant specializes in food that goes well with beer and other drinks and they have won several awards for their burgers and other bar food such as hot dogs and wings. There are plenty of TVs in the dining areas and sports are often on the screen. The award-winning burger at Angry Dog is a 1/2-pound beef burger served with mustard, mayo, raw or grilled onions, lettuce, tomato, and pickles on the side. All burgers and sandwiches are served with a side of french fries, pasta salad, or refried beans. Liberty Burger is a restaurant from the well-known Street family, which owns restaurants such as Good Eats and Black Eyed Peas. The restaurant features more than ten high-end burgers and serves wine by the glass. Liberty Burger specializes in several healthy burgers, such as the turkey burger with mustard on a wheat bun and one of the best veggie burgers in Dallas. Liberty Burger's beef patties are made from a custom blend of free-range, grass-fed chuck, brisket, and tenderloin. Guests can choose from sides of fries, sweet potato fries, onion rings, or several tasty salad options. The chain has several locations throughout Dallas and other cities in Texas. Neighborhood Services is an upscale restaurant serving delicious burgers and other American favorites. Their burgers are made from aged chuck topped with aged cheddar. The combination lends itself to a particularly pungent flavor. The burger is topped with mayo and mustard as well as onions and pickles. The meat used at Neighborhood Services is sourced from Southeast Family Farms in Alabama and the restaurant is the only restaurant in Dallas which serves this specific variety of quality dry-aged meat. The burger comes with a side of fries and special sauce for dipping. In addition to burgers, the restaurant serves a variety of non-beef options. 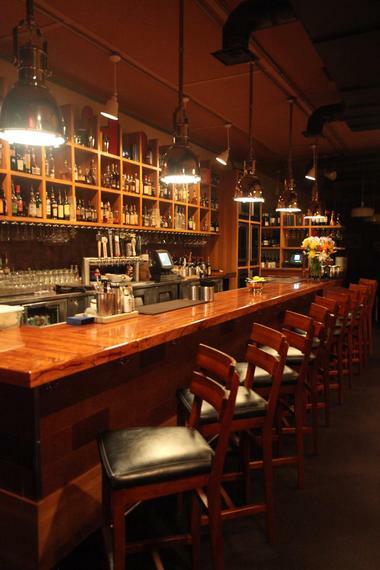 Neighborhood Services is a popular date-night destination and reservations are recommended. Off-Site Kitchen is a fast-serve, grab-and-go stop offering gourmet burgers, brisket, and french fries. The restaurant features a tiny dining room with stool seating. Off-Site specializes in offering quick service without compromising on quality and flavor. The beef patties are smashed thin on the grill and feature a nice, crispy char. The restaurant offers a large variety of topping options, such as shredded lettuce, bacon jam, roasted jalapeños, and a tasty special sauce. Guests can't go wrong with the Stock Cheese Burger, but to really get the full experience, they should go ahead and try doing it Murph-Style, which is a heavily loaded burger with tons of special toppings. Stock and Barrel is an exciting eatery on Dallas' main drag. The restaurant features a large, 2,800-square-foot indoor dining space as well as a pet-friendly outdoor patio. Additionally, diners can sit at one of the 11 counter seats looking into the open kitchen. 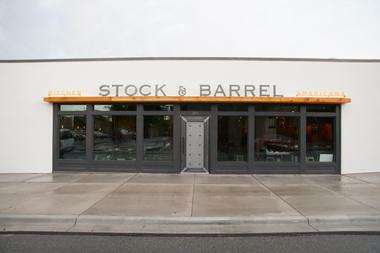 Stock and Barrel is open for dinner from Tuesday to Sunday and serves brunch on the weekends. The American restaurant specializes in a variety of fish, poultry, pastas, and dumplings. The chef has also devoted an entire section of the menu to special fried potatoes. The burger that landed Stock and Barrel on this list is the Wagyu Brisket Bacon BBQ Burger, which is topped with aged cheddar, horseradish pickles, and crispy onions. 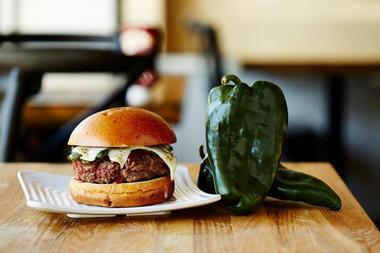 Chop House Burger is the less-fancy sister of the Dallas Chop House. 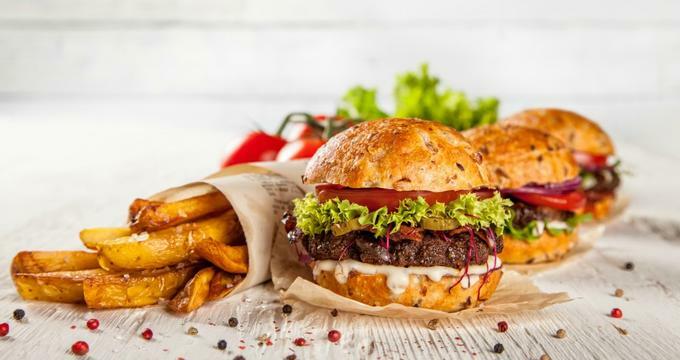 The burger restaurant originated from the popularity of the burger at the original restaurant and the company decided to open a restaurant completely dedicated to it. 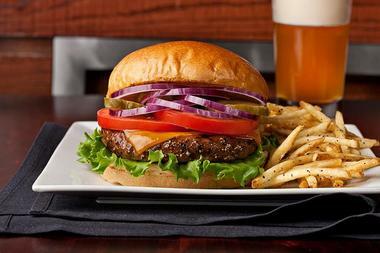 Chop House Burger prides itself in serving fresh, local produce, local craft beer, and Angus beef. The menu is simple with the Chop House Burger as the highlight and alongside it a solid offering of non-beef options, including a tuna burger, falafel burger, fried chicken sandwich, and ground turkey burger. The restaurant serves lunch and dinner every day except Sunday. Flaming Burger is a stark, basic, counter-serve joint that serves burgers with mounds of toppings as well as hot dogs, sandwiches, and salads. The owner is local to Dallas and spent quite a bit of time learning about creating a perfect burger from Dallas legend Jake Keller. The burger is served on a poppy seed bun with a side of french fries, tater tots, onion rings, or sweet potato fries. The menu features 14 burgers ranging from a simple single-patty hamburger with mustard, lettuce, onion, tomato, and pickles to the popular Marko's Special, which consists of two patties, Monterey Jack, bacon, hot mustard, mayo, ketchup, veggies, and jalapeños. Griff's was founded in 1960 in Wichita, Kansas, with a vision to serve quality food at an affordable price point. They started off serving hamburgers, cheeseburgers, fries, shakes, and soft drinks. The menu has grown since that time, and the restaurant has expanded to multiple locations, but the restaurant's commitment to delicious, affordable food still remains. 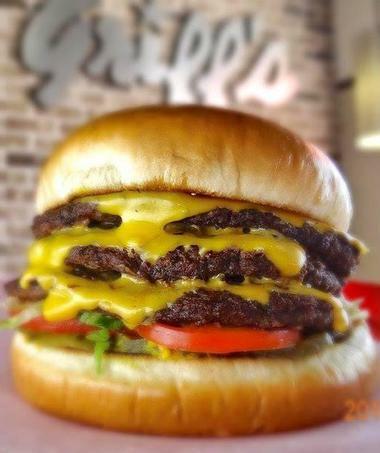 Griff's offers five choices of burgers, ranging from the giant and double giant hamburger and cheeseburger to the mammoth triple giant cheeseburger. All of the burgers can be ordered as a combo with sides and a drink. In addition to burgers, the restaurant serves steak, chicken and fish sandwiches, steak fingers, desserts, and milkshakes made from real ice cream. Harvey B's is a retro, counter-serve diner that serves burgers, hot dogs, side dishes, and soft serve based desserts. 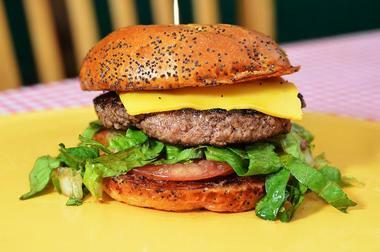 The burgers are based on ½-pound single and double beef patties. Burger toppings range from bacon and cheese to cream cheese and jalapeños. Guests can add a side of cheddar spiral fries, plain fries, onion rings, tater tots, and cheddar poppers. Other non-beef menu options include an adult grilled cheese, BLT, and chicken-fried steak as well as salads and Frito pie. The family-friendly restaurant features kids' meals with options of a burger, grilled cheese sandwich, or corndog served with tots and a drink. JG's Old Fashioned Hamburgers serves several burger options in a cozy, nostalgic atmosphere. The food is prepared with great attention to detail and that same attention is reflected in the restaurant's service and decor. Burgers and sandwiches are prepared with high-quality certified Angus beef, a selection of homemade toppings, and fresh condiments from the amazing condiment bar. The sandwiches are best accompanied by JG's fresh-cut Idaho potato fries and old-fashioned milkshakes. Other sandwich options include chicken and club sandwiches as well as turkey and veggie burgers. The dining room walls are packed with vintage decor and memorabilia, giving the restaurant its distinctive atmosphere. Maple & Motor is a busy counter-serve burger joint that features no-frills decor and is serious about serving burgers. The restaurant has received recognition from several publications and has even been recognized by Guy Fieri from the Food Network. The restaurant is simple, but the burger is memorable and well constructed. The burger is massive in diameter and topped with the traditional Texas selection of toppings of cheese, mustard, lettuce, red onion, and dill pickles, served on a hot toasted bun. Guests can add jalapeños for an extra kick. Maple & Motor also serves a fried baloney sandwich, brisket sandwich, and BLT as well as several other sandwich options. Rodeo Goat originated in Fort Worth but has made a name for itself as it has expanded into Dallas. The restaurant specializes in burgers with flair, but the Royale with Cheese is the best choice if you are looking for a traditional cheeseburger. Even this simple, traditional-style burger has a bit of flair in its condiments as it is topped with jalapeño bacon, spiked ketchup, mustard, and chopped onion. To really have the true Rodeo Goat experience, however, you have to throw tradition to the wind and try one of their more unique burger creations. With names like the Terlingua, Cowboy Murrin Burger, The Negril Beach, and a veggie burger called The Neil Young, the Goat's burgers are sure to keep your taste buds guessing. Village Burger Bar is a casual eatery serving paninis, burgers, sides, and more. The meat at the restaurant is delicious, but it's the selection of sauces that makes Village Burger Bar truly unique. Burgers are completely customizable. Options include jalapeño mayo, champagne mustard, artichoke aioli, and more. Other interesting topping options include fire-roasted chilies, bourbon caramelized onions, and dried cranberries. Side options are unique as well and include delicious sweet potato fries tossed in cinnamon and honey. The restaurant has several locations throughout Texas. Stackhouse is a cozy eatery that serves simple but delicious burgers and beers. The dining room is furnished with classic butcher block tables. The burger menu features single, double, and veggie patties topped with lettuce, tomato, red onion, and pickle, served on a toasted bun. Guests can choose from a long list of toppings to add to the burgers, including cheese, pickle relish, Canadian bacon, pickled jalapeños, and sauerkraut. The menu additionally includes several sandwiches, salads, soups, and sides. Tasty homemade desserts such as oatmeal cream pies, chocolate chip walnut brownies, and carrot cake provide the perfect finish to a meal at Stackhouse. Twisted Root Burger Co., Deep Ellum, Photo: Twisted Root Burger Co.